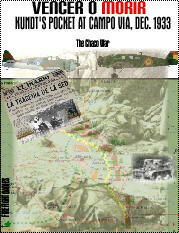 Vencer o Morir (to win or die) covers the largest single battle of the Chaco War in December, 1933. The forces under General Kundt, the Bolivian commander, consisted of the 9th, 4th, and 7th Divisions stretching from Arce to Nanawa (where the failed Bolivian tank attack had occurred in July). 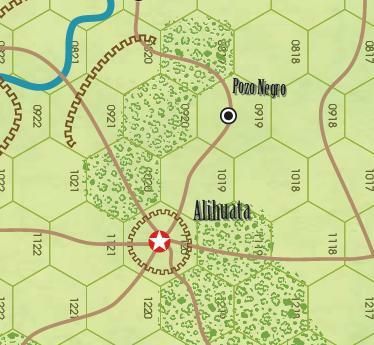 However, both the 9th and 4th Divisions were threadbare units, with the 4th barely escaping when the Paraguayan’s struck at Gondra earlier. Known as the Battle of Campo Via, the Paraguayan’s had massed (with the knowledge of the Bolivians’ air reconnais-sance units) twice as many of divisions aimed at the thinly de-fended lines and no Bolivian reserves. Just north of Alihuata, the Bolivian lines simply dangled. The warnings Kundt received from his own commanders along the front were all ignored. The resulting battle is akin to what happened 11 years later in 1944 to the German Army. That battle was, "Destruction of Army Group Center". The map scale is about 2 miles per hex. Each combat unit is a battalion sized unit. HQ’s are represented by a Paraguayan or Bolivian flag. A game turn represents one day. Tanks and Armor cars represent one of each type. Artillery are batteries.